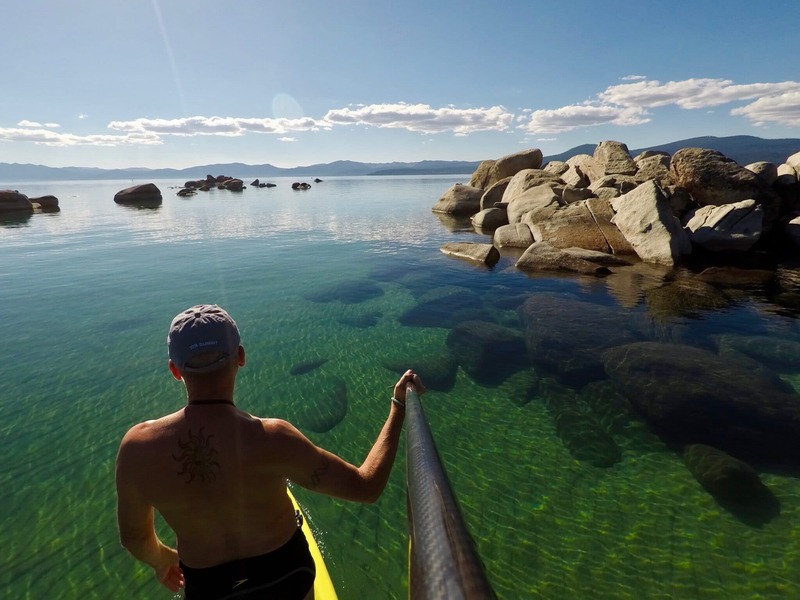 Why does Lake Tahoe appear to have different colors? As light penetrates the Lake, water molecules absorb various colors. Fine particles and the exceptional clarity allow backscattering of the predominating light color toward the eye of an observer. The lake water appears blue as other colors in the light spectrum are absorbed at deeper depths and the predominant blue light is scattered back toward the observer’s eye. The center of the Lake can appear indigo, as blue light is absorbed further, leaving more visible violet light as the predominant light color. In shallow areas, the water can appear emerald or turquoise in color since green is the predominant light color at shallow depths. In addition, under the right conditions, the Lake surface can reflect the adjacent mountains and the color of the sky.